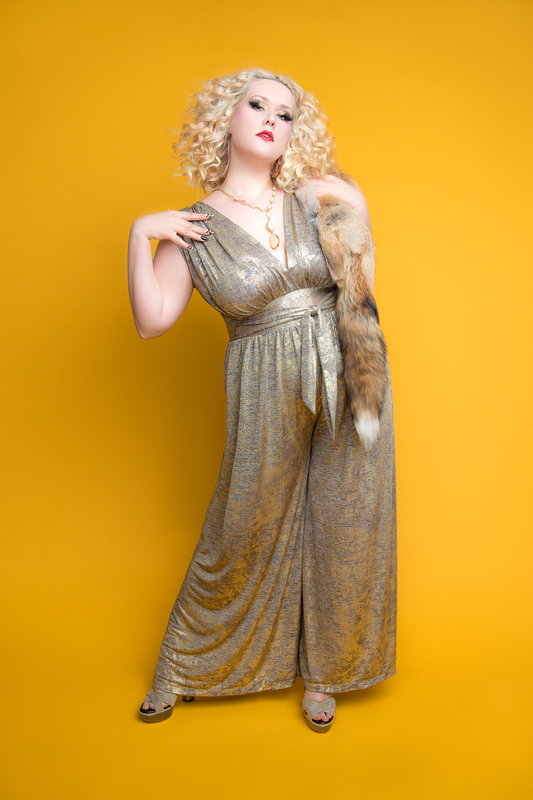 I am serving up some 1970s, disco diva glam today in my fabulous golden jumpsuit! I’ve got my fuzzy friend Chloe to keep me warm and I’m ready to hit the dance floor! Today I bring you my favourite photo set to date that I have shot with Geoff Larkin. With a look inspired by Amy Adams in American Hustle, we made use of the dramatic lighting in the bathroom at the loft in which we shoot. I love the plunging neckline with loose cleavage that Amy has in the film and was very influenced by that classic 1970s look. The results are sultry, sensual and seductive with cigar in hand. I hope you enjoy Madame Dolly’s mirrored gaze. Today is the premiere of the 7th season of Mad Men!! 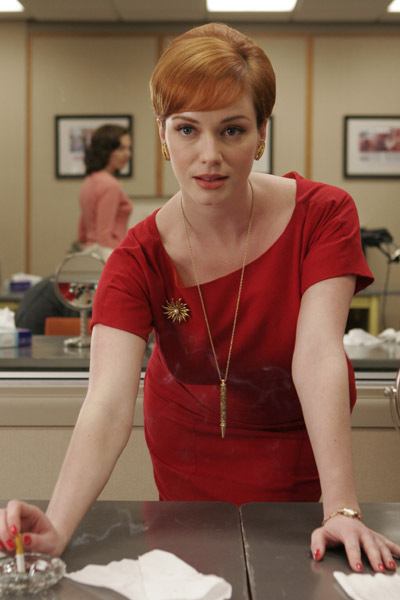 I have been a die-hard fan of Mad Men from the get go. Not only is it one of the most intelligent, well-written and captivating shows on television it’s also packed full of amazing costuming, styling and set design. Seeing all those beautiful 60s/70s outfits really inspires me creatively. 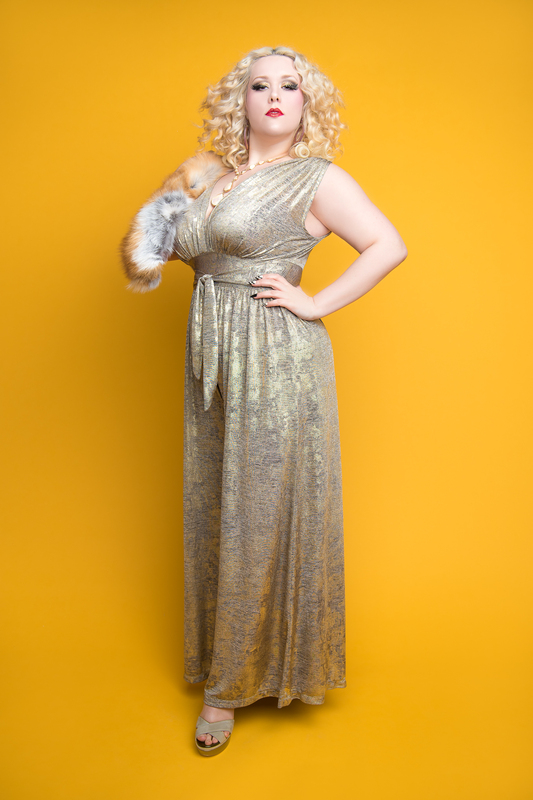 I just had to cosplay my favourite character from Mad Men, Joan Holloway! To make this dress I bought a vintage 60s dress pattern and picked a very Joanie red fabric. This dress is super comfy and I actually wear it to my work (as a receptionist) quite often. 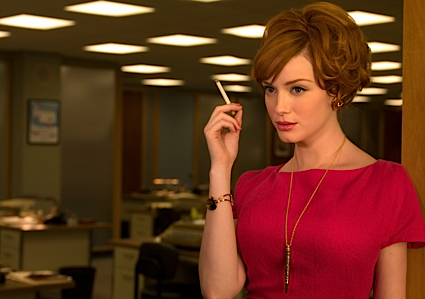 I like to embrace that Joan strength and power when I sit at my desk as work.